I've been reading "Just An Earth Bound Misfit, I" recently, which led me to this story about the war in Afghanistan. It is a year old, but since it is about insurgencies in general and not just Afghanistan, it still makes a great deal of sense. Actually it's just regular butter, but it's in a new, smaller package. Just showed up in my refrigerator. Half the size of a regular block of butter. Sorry for the crude paste-up job, but I wanted to include some color, and I didn't want to spend endless time adjusting the sizes of the two images. That will come later, after I am supposed to be in bed. Mr. Surowiecki gives "the people" too much credit. People are opposed to inflation, if they even know what the word means, because newspapers have been telling them it is evil for the last umpteen zillion years. Inflation has been a fact of life as long as most people in this country have been alive. It goes up, it goes down, but it is continuous. One of the other things newspapers are constantly harping on (at least they used to, I haven't been listening lately) is the low savings rate for Americans. This is awful, the Japanese save much more money than we do. We should be more like the Japanese. Well, what's the point in saving any money if it is going to get eaten by inflation? 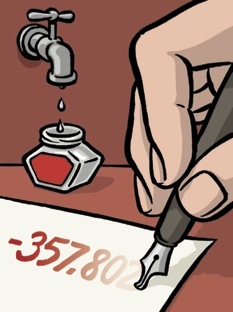 Put your money in the bank and every year, if you are lucky, it only loses one or two percent of its' value. Shoot, in 50 years, it will be worth absolutely nothing. Only question is why would anyone open a savings account in the first place? At the end he claims a purpose to the economy, which is akin to imparting a purpose to life. It may serve a function, which in turn may serve a purpose, but the economy does not exist to "maximize our well-being". It may serve that purpose, but it may serve any number of other purposes as well, such as maximizing the number of unemployed. Actually, I think the economy does have a purpose and that is to concentrate as much power into as few hands as possible. Only when we have one God-King and everyone else has been reduced to serfdom will this purpose have been fulfilled. If you try the links and they don't work, please let me know. They work for me, but who knows what's going on in the background. Maybe they know my IP address. Maybe they love me. Well, no, I'm pretty sure that's not it, but I think you get the drift. I finished reading this book a couple of weeks ago and I still don't have a good handle on it. Syaffolee just put up a post about it and she manages to summarize it neatly, but then she's a talented writer. Last weekend I moved Kathryn to Eugene. After she got done loading her stuff in the mom-mobile (2006 Mitsubishi Endeavor) there wasn't any room for anyone else, so it was just the two of us. It took as an hour to unload the car and carry all her stuff upstairs to her second floor apartment. Yesterday we took John to Eugene. Four of us were going this time. He didn't have as much stuff, but it was still more than could be crammed inside Mom's car, so we hauled out the RocketBox, clipped it onto the roof rack and stuffed it full of more stuff. Since we had a bigger crew this time it didn't take as many trips to unload all of John's stuff, which was good because he's living on the fourth floor of a dorm. Yes, there was an elevator, but there was only one and it was slower-than-molasses, not to mention everyone else is using it because it is, after all, moving day. I think this is only the third time I've used the RocketBox. We used it once, umpteen years ago, when we took the whole family to Iowa in the Windstar, and I think we used it once when we went skiing in Bend, but other than that it's been sitting on it's custom made brackets near the ceiling in the garage. I've thought about selling it a couple of times, I mean it ought to be worth a couple of bucks, and I wasn't using it. And then boom, circumstances collide and it comes in real handy. Mounting it to the Endeavor was no big deal, it had a roof rack already. Just a matter of loosening the wingnuts on the crossbars and sliding them apart. We did have to make some adjustments. The RocketBox really needs to be tightened to the cross bars before the crossbars are tightened to the side rails. After it was mounted, we couldn't open the tailgate all the way as the rocket box was hanging over the back end. We couldn't slide it any farther forward because someone had pop-riveted a couple of straps across the slot in the rails. I think this might have something to do with sun roof. The roof up there might not be able to take the load. We loaded the RocketBox with fluff and nonsense, so there was no weight to speak of, so we probably could have gotten away with removing the stops. We tied the rocket box closed just to be safe. I had never done this before, and I had never had any trouble with the latches, but I never really trusted them. I mean the whole thing is kind of chicken-s***. It looks like this big, strong, bullet-proof case, when in fact it is a thin piece of blow molded plastic. The hardware that goes into mounting it to the racks is substantial, but the box itself seems dangerously flimsy. The latches are just little metal clips that seem like one good blow could dislodge them, and the locks don't do anything to make them more secure, they just keep the release button from being pressed. On the other hand, the guys who built this thing must have know what they were doing because in four thousand miles of travel I have never had any trouble with it. You want to know what the best part is? We drove home with it empty. It stayed closed the whole way without any problems, and it wasn't even latched. Update December 2016 replaced missing slideshow with picture and link. Okay, technically it's not a bumper sticker, but it was stuck on the back of a car. This isn't bad. We've got a mix of adventure, entertainment, technology, science, and social engineering. Some people at Berkeley have made a low power microscope that fits on a cell phone. Their intended application is for remote medical diagnosis, places like Africa. Popular Science sent me a link to this movie, made with this microscope and a cell phone. Update February 2017 replaced missing video and broken link. I'm looking at attempting to repair our Sebring myself. Reading the shop manual I find that pulling the engine involves lifting the body off of the engine, rather than the other way around. Looking around for a hoist that can do this, I come across this video. It shows what goes on in repairing the damage from a little fender-bender and lasts about 5 minutes. Starting at the 2:35 mark, they devote about ten seconds to lifting the body off of the engine. I am planning on trying to do this with an engine hoist. I will probably have to build some kind of jig to be able to lift the car body. Might be able to use a couple of 4 x 4's chained together. We shall see. Update March 2015 replaced missing picture. Stopped by Fred Meyers (local big box grocery store) after lunch today to return a $12 set of mixing bowls, an annoying but somewhat worthwhile task. When I get to the counter there are two people in front of me. The old fool at the counter is having some kind of extended discussion with the person behind the counter. I think he is buying hunting licenses. This is going to be bad. I don't know about other states, but hunting regulations in Oregon are insane. There are days and times and county lines and which side of what stream and what kind of animals can be taken and they go on for like a gazillion pages. I understand Freddie's wanting to be helpful, but would it have killed this old fool to figure out what he wanted before he got there? Well, maybe. I get tired of waiting and go look for a piece of glass to replace the one I broke in Eugene yesterday. The bedroom light fixture in dutiful daughter's new apartment was flaking out, so I took a look at it. It has four tulip shaped glass shades around the bulbs. One of the bulbs was being flakey, so I tried another bulb. Somebody had kicked this bulb and put a dent in the threads, but hey, light bulb threads are not exactly precision machinery, let's try it anyway. I try it and it quickly gets jammed. Okay, it won't go in, I'll just unscrew it. Umm, we seem to have a problem here. Unscrewing the bulb causes the socket to start unscrewing from the fixture. I take the tulip shade loose and slide it down so I can try and grip the socket and keep it from turning. No luck. Fine. We'll smash the bulb, take the shade off, and dig the base of the bulb out of the socket with hammer and tongs. Put a paper bag over the bulb, locate the bulb by touch, whack it with the hammer. Doesn't break. Dang, what are they making light bulbs out of these days? Whack it harder and it breaks. Take the bag down and the bulb is still intact. I have managed to smash the tulip shaped glass shade. Great. Once more with the bag and hammer and this time I get it right and break the bulb. Now I can remove the remains of the broken shade, which allows me to get at the socket and remove the light bulb base from said socket. But now I need a new tulip shaped glass shade, so I thought, since I was already going to Freddies, I would try them. They have some glass pieces, but no exact match. Oh well. Back to the returns desk. The old fool who was clogging up the works was still there, still fussing with his hunting licenses or whatever it was, but now we have an additional person working the desk. (What a good idea! What won't they think of next?) He takes care of the two people ahead of me and myself. I am leaving the store and the two people who were working on the hunting licenses when I got there are still working on them. I think that's one reason I don't go hunting. The car-car (2001 Chrysler Sebring) blew up. I had it towed to Eric's shop. He thinks a head gasket has blown. Only way he will fix it is to replace the motor with a rebuilt one. It's an aluminum V6 and it's had some cooling problems. I thought these problems were minor, but evidently aluminum engines are more sensitive to this stuff. Head gaskets blow when the head warps, usually from overheating. Problem with aluminum engines is that oftentimes the block will warp as well, so to do a proper repair, the block needs to be resurfaced (machined flat) as well as the head. To do that, you really need to completely disassemble the engine. If you are going to do that, you might as well just buy a remanufactured motor, and that runs between $2500 and $4500, depending on whether you buy it locally, or buy it over the internet from an East Coast engine rebuilder and have it shipped across the continent. All kinds of things could go wrong here. A file is good for knocking off high spots, but if there is a low spot, that means the whole surface would need to be taken down, and that is a job for a milling machine, not a file. Then there's the debris problem. Filing creates little bits of metal, most of which will be captured by rags, cleaned up with a vacuum or blown away by compressed air. However, by the nature of machinery some of the smallest specks will fall unnoticed into places where they will lie, waiting for their opportunity to wreak havoc on some sensitive part, like a piston ring. What to do? Do I invest a bunch of time and energy on a possible cheap fix? Or do I bite the bullet and spring for the new motor? The car is worth just enough to make replacing the motor worthwhile. I don't know if parking in San Francisco is actually worse than it is in Portland, or if it just seems that way because it was unfamiliar to me. A week ago Saturday Kathryn and I borrowed my brother's van and headed downtown to the farmer's market at the Ferry Building on the Embarcadero, which is a street that runs along the waterfront in downtown. We got to downtown on Mission. We drive by a parking garage across the street from Bloomingdales (which backs onto the Westfield Center, where we had lunch later on). It might be a good place to park, but I want to see just how far it is to the Ferry Building, so we drive on until we get there. It's not too far (about a mile), but the Embarcadero is a parking lot and it takes forever to get turned around and head back the way we came. We spot two parking garages on the way back, but one is a city garage and is closed for renovation and the other is only open on weekdays. There are lots of parking meters, but they only take coins to the tune of $3.50 an hour, or some sort of card that you have to get beforehand from some unknown location. We finally spot a hotel with parking. The guy quotes me $10 for the first hour, and $4 an hour after that. Fine, we've been in the car for pert near two hours and I am ready to be out. Turns out the rate was $4 for each additional HALF-hour, which made our total parking bill $30 for three and a half hours. Fortunately they take credit cards. We went out to eat a couple of times in Central San Francisco, not downtown, but busy areas. My brother drove. Sometimes we had to drive around five or six blocks before we could find a place to park, and it was always marginal. There are never any open parking spaces on business streets. It looks like there are lots of spaces on the surrounding residential streets, but they are actually driveways, fire hydrants or loading zones. Once we found a place to park between two driveways. Dan had to adjust the car twice to avoid impinging on the driveways. We are talking inches here. Down in the Sunset, where he lives, it's a little better, but not much. Houses are built right next to each other, like row houses, but each one is a little different. Most houses have single garages and a single driveway. Sidewalks are wide, 15 feet minimum, and go from the street to the front of the house. Some houses, maybe half, have some kind of shrubs or flowers out front, but you are just as likely to see a car parked on the sidewalk. Once again you have the appearance of lots of available parking spaces on the street, but they are actually driveways. Lots of concrete, asphalt and stucco and virtually no grass. The North-South streets are a normal width: four lanes, two traffic lanes in the center with one parking lane along each side. The East-West streets are like expressways: six or seven lanes wide, and they go for forever. I'm pretty sure I've seen these streets in the movies. There is very little traffic because every two blocks there is a stop sign. It's very odd. On one hand it feels very cramped, on the other it seems like there is an awful lot of space. Next time there is a boom here I would expect this area to be made over. Don't leave anything valuable, or anything that looks like it could contain something valuable, like a paper bag, in your car because that is a recipe for having someone break into your car and steal it. We were on our way to a shooting event of some kind, one of my brothers, I think it was Andy, and I. We came across a military ammunition facility and thinking this might be a good place to score some cheap ammo, we stopped in. We came across three women taking apart pallet loads of ammo. I asked the one in charge if it might be possible to buy some ammo. She was aghast at the thought of buying it. Her attitude was something like "take a look around you, what do you think we're doing here? Take whatever you need." Wow, such an invitation. They've finished whatever they are doing, so I head into a warehouse. I come across a stack of boxes of ammo. The boxes are like regular ammo boxes, olive drab metal with watertight lids, but these kind of an odd shape, like 6 inches wide by 2 feet long by 2 inches tall. I open it up. It's hand gun ammo, but not a type I need. It looks like 380 or something similar, though "one half" sticks in my mind. I can't use it, but maybe somebody else at the shoot can, so I start lugging it back to our truck. I meet my brother coming the other way and try to persuade him to take the box back to the truck, but he's having none of it, and goes on by me. I put the box of ammo on the floor of the cab of our truck and go looking for something we can use. I go back in the warehouse. The warehouses are old dark brick with concrete floors and multiple large rooms. Pallets are stacked neatly one, two, three or more high as you expect to see in a warehouse. I find stacks of pallets of ammo, but none of it is a caliber I need, so I decide to go back to my original plan and see if I can buy some, so I head for the office. On the way I come across one of the women who was unstacking pallets when I first arrived. She's driving some kind of little pusher, standing up, pushing a long row of carts. She looks absorbed in what she's doing, so I don't bother her. I stay away from this train of carts, and follow her along, as she is going in the same direction as I am. We get to the "office", which is just a section of the warehouse floor near the back that is given over to desks. The train of carts goes in an aisle right through this office area. There are some people standing there talking so I approach them thinking I might get some answers. The are involved in their conversation and it takes a while to get anyone's attention. One middle aged manager type finally deigns to talk to me and says sure, he can sell me some ammo. We are outside looking through pallets scattered on the lawn. We are looking for 50 caliber and thirty-ought-six ammo, but we aren't finding any. He has become distracted and is no longer focused on our mission (my mission). A semi-tractor towing a lowboy trailer arrives slightly uphill from us. Some army guys are unloading a pickup truck from the lowboy, but instead of rolling it off the back of the trailer, they tip it over the side. This startles me into moving away as the pickup is going to roll over and crush us. My companion is not concerned. He puts up a hand to stop the truck, which is enough as the hood of the truck has run into a pallet of stuff and stopped the truck from rolling any further. Hard to tell if this was realistic. I suspect in real life the rear end of the truck would have kept coming. But that would depend on the steepness of the hill. Kathryn ran across this place last time she was here, so naturally we had to stop by and sample the wares. We were so busy goofing off that we didn't get around to stopping in till we were on the way to airport. We got a pretty amazing show. It's about 9AM and there are a lot of people standing around waiting for coffee. Once we get past them there is virtually no line at the register, but the cashier tells us to repeat our order to the barristas: they don't keep track of what you order. There are two guys making drinks and they are just flying. Right away one of them wants to know what we are drinking, which makes me think that our drinks will be ready soon. They don't have an espresso machine, they are making drip coffee. They each have four funnels in front of them, a hot water dispenser between them, and a coffee grinder on the counter in back of them. Each drink involves putting in a paper filter in the funnel, pouring in the right amount of coffee and then the water. Slap, bam, boom, no hesitation, no fooling around and the drinks appear, one after another. But not our drinks. I think the guy we were waiting on must have made about 10 drinks before he got to ours and he made them all correctly. Just amazing. P.S. While I was in San Francisco I stopped ordering regular coffee and started ordering lattes. Every regular coffee I got tasted like Starbucks coffee: way, way too strong. A latte is just coffee with milk, which is how I drink my coffee anyway. Kind of stupid to have to pay extra just for the fancy name, but at least it's drinkable. We ran into several odd people while we were in San Francisco. Our first one was a woman working at the local Safeway collecting grocery carts. She's hustling carts, bagging groceries and carrying on conversations with customers left, right and center. Click the pick to see the video. On Sunday we went from a walk in the park out to Land's End. We saw this guy going the other way. He seemed a little off. He was looking at some plants by the side of the path and he pulled one up. He only has one sock and he has an empty id holder clipped to his shirt. On our way back we catch up with this same guy, and again he is looking at something on the ground by the side of the path. He picks it up and examines it. He notices us walking by and he turns to me and hands me a key telling me something about his "soistahs" and to take a few days for myself at Goth (Gough?) & Broadway. Then he walks off on another path, smiling and waving. Why did he pick me? Later on Kathryn tells me she could smell alcohol on him. On Monday we spent some time walking around the Fisherman's Wharf area, which is mega-tourist land. We're walking down the sidewalk. The edge of sidewalk along the street has stuff on it like parking meters, plants, signs, trash cans, etc. Up ahead we see a couple walking and just as they pass by a bush, the bush leans out and roars at them. Gave them a start and gave everyone else a good laugh. 30 seconds later the performance repeats itself. I howled. I gave the guy running this ruse a buck. Funniest thing I've seen in a while. 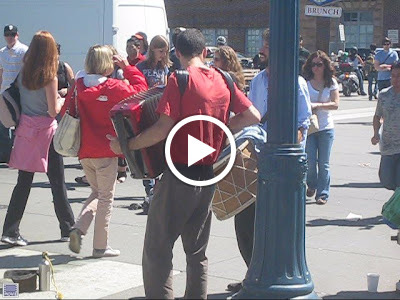 Tuesday we went to Haight-Ashbury just to see what it looked like. There was one black man sitting on a box on a corner yelling his head off. It was mostly unintelligible, but occasionally I thought I could hear him say "Get A Room". On Wednesday, on our way to the airport we were stopped at a light and we saw a woman stop in the middle of crosswalk and put on some kind of performance. She might have talking to someone in another car, or someone we couldn't see, or someone who wasn't there. She was gesturing and, for want of a better word, posing. It was quite a show. While I was in San Francisco I found an apparently simple number puzzle on the comics page of the local paper called Challenger. I spent a few minutes trying to figure it out, but when the answer didn't jump out at me it began to look like work and I bagged it. Still it was intriguing, and since it involved numbers and simple rules of arithmetic, I should be able to write a simple program to solve it when I got home, which I did. The program is simple, but it is not elegant. It uses the brute force technique of simply trying one possible solution after another until it happens upon one that works. It took me about a half hour to write it, and five hours to run to completion. Seems there was a bug in my code. I fixed the bug and sent it off again, and five hours later it had again run through all the possible answers without finding a solution. Found and fixed the (apparently) last remaining bug. This time it found a solution in just under 20 minutes. So it works. It is not elegant, or quick. A different problem could take hours to solve. which is a very fine story of life in the programming lane. I tried Dream-In-Code, but after I posted my program, I couldn't find it. Not only that, their list of snippets does not appear to be in any logical order, nor is there a sorting ability. They have a search capability, but it didn't help. Worst of all though, is it is slow. I have no more time to spend on this right now, so I posted the program as a Google document. Not the best solution, but it will have to do for now. Just got back from a week in San Francisco with my daughter visiting my brother Dan, his wife and new baby (!!!). Baby is only two months old. It's been a long time since I've been around a kid this small. It was fun. I'm so much older than her it's like she's my granddaughter. We hiked around town, went out to eat, did a little shopping (I bought a battery for my watch). 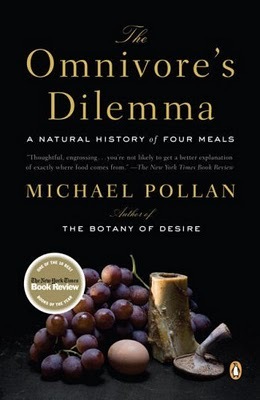 I finished reading The Omnivore's Dilemma. It is an amazing book. He covers more ground in one volume than you could get out of a dozen lesser books. It will take me some time to digest it. I wanted another book for the flight home, but I was pretty beat, so I picked up something light at the airport bookstore: Fearless Fourteen by Janet Evanovich. Funny murder mystery. I get a kick out of it every time I open it. Paranoia (or common sense?) kept me from putting up a note explaining my absence here. I could have put up a few post-dated posts before leaving, but that would have required planning ahead. I had access to a computer, so I could have posted while I was there, but it was nice not to be slaving away at the computer for a while. Anyway, I was away, I had a good time, and now I'm back. It's 6:23 AM. It's been that time for the last four days, at least according to my watch. I think I need a new battery. Target doesn't do watch batteries. That's the only place I've been lately that one might think would have a watch battery. Oh, well. Today's another day. Maybe I'll find one today. We watched Down By Law yesterday evening and Once Upon A Time In The West tonight. Boy, they were slow. The Sergio Leone (made famous by Clint Eastwood's spaghetti Westerns) Western, with all the great actors was two and a half hours long. Lots of long, slow-moving scenes punctuated with gunfire. And then we have Claudia Cardinale's bosom. That was a pleasant diversion. Henry Fonda (1905-1982) plays a bad guy. 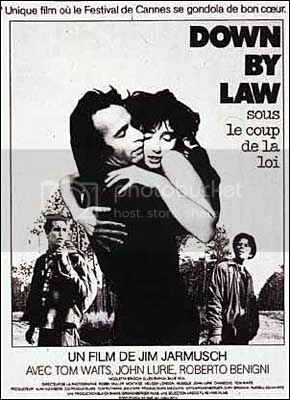 Down By Law was shot in black and white and is some sort of art house film. It's got Tom Waits in it, for Pete sake. He and another guy get set up and end up in jail with Roberto Benigni of Life Is Beautiful fame. Time drags for them and for us. The only break is the "I scream for ice cream" scene. It is pretty good. Eventually though Roberto figures a way out and the three of them escape. After days (weeks? months?) lost in the swamp they stumble upon a road, and eventually, a roadside cafe. Roberto goes inside to check it out and leaves the other two stumble bums outside. He's supposed to give them the all clear, but he doesn't. Eventually (again!) our two stumble bums go to find out what's happened to their Italian buddy. What's happened is that he has fallen in love with the lovely, single, Italian proprietoress of this fine institution, and forgotten all about them. Something bad happened to the Chrysler yesterday morning. I won't know how bad until Mr. Heaton takes a look at it. It may be time for another car, which brings us to part two. Which brings us to part three. While we were looking one of the ads vanished from the net. Well, it should be in the cache, I can retrieve it from there and harangue the guy about it. So I'm trying to figure out how to pull the file from cache, and I'm not getting anywhere. Seems Firefox has a "new and improved" cache management system - it compresses all the files and stores them in one giant database. I dig around looking for a viewing tool, but no luck. I finally resort to the Firefox help forum and in a surprisingly short time I have an answer: CacheViewer, an Add-On for Firefox. It installs quickly and easily, though it does require restarting Firefox. It's not readily apparent how to view the file. Pictures show up in the window in the upper left hand corner, but to view html files you have to right click. I find the ad and with it I get the guy's email address. I write to both of them (the X5 seller and the Range Rover seller), just to see if anybody answers, and they both answer promptly. The first guy is a Master Sargent in the Air Force and is stationed in Alaska, and guess what? The second guy is a Master Sargent in the Air Force and is stationed in Alaska. What are the odds? These guys in the Air Force must be making pretty good money to be able to sell these fancy cars so cheap. I smell a rat. Especially when the first guy wants to ship the car via an Air Force cargo plane to a nearby airport. I know corruption is rampant, but even this is straining my credulity. No, you aren't getting into heaven. There's a stop sign in your way. Dutiful daughter and I are driving our 2001 Chrysler Sebring back from Beaverton this morning and something goes wrong. We are almost to our exit, but we are still on the freeway and she's putting on the brakes. No, she's not, she tells me. Stepping on the gas has no effect. We coast to a stop half way up the exit ramp. The engine has died, and it won't restart. It cranks, but she no catchee. Fine, get out, open the hood. Uh oh. We've got brown oil sprayed over half the engine. Looks like it got blown out the filler cap. I don't think we're going to fix this with jumper cables. Should we call a tow truck, or should we get my truck and try towing it with a rope? Well, is there any place to even tie a rope onto the car? Um, no, there isn't, not unless you want to hook onto the front suspension, and even then you are going to impacting the lower body work. So no. Call home, wake someone up, they give us a number for a Hillsboro tow truck company. I call them and get put on hold for ten minutes only to be told that Hillsboro is not in their service area. A Mexican dude pulls up on a fancy sport bike. He's wearing these cool motorcycle boots with what look like toe protectors. Says he's a mechanic so I show him the mess. He gives us the number of a friend of his with a tow truck. We call the friend. Two people answer, they are both yelling unintelligibly, then the phone disconnects. We try again similar result. Third time I think I am able to communicate. Guy tells me it will be 20 minutes. I spend the time arguing with my daughter and looking for treasure. Half an hour later still no tow truck. Call him back, more garbled communication, something about a 460. I don't think he's coming. 'Bout this time my wife shows up. We finally get the correct phone number for Hillsboro Towing. Clear, prompt, businesslike communications. The truck will be here in half an hour. The girls take off and I wait for the truck. (I spend the time reading the Omnivore's Dilemma. Very interesting. Probably have to write something about it, if I ever finish it.) The tow company sends a flat bed for which they charge $55 for loading and $5 a mile for carrying. Much better than the $90 the first outfit wanted. And he even gave me a ride home. Racial profiling: Three vehicles stopped to inquire about our status. Two were Mexicans and one was a white guy. A white guy on a bicycle came by and inquired, but he didn't stop. He didn't have a chain anyway. A cop stopped someone on the freeway right by the exit, but he didn't stop by. None of the new Beemers that came by stopped. Can't say as I am surprised, I generally don't stop either. I've been hearing about "Chevron with Techron" for like forever. I figured Techron was just a name they came up with for their own particular flavor of jungle joy juice. But today I'm driving down to Eugene and I see a billboard advertising "Texaco with Techron", which really surprised me. Why would Texaco use a Chevron brand name? Could it be that they are actually the same company? Oh. They are. That's why. How's that for facts? So this report is from 2006. The government spent $200 million a year on this campaign, and here it is 2010 and this is the first I've heard of it. Of course, I'm not their target demographic, so that might be understandable. I do wonder how much they spent on it this year. Criminals. We really do need that sarcasm font. I am tired of being unemployed and I am tired of looking for a job. It's not that I am worn out physically, it's that I have not had any real positive results (like an interview, or even an indication of interest) in quite a while. So I decided I needed another approach. I'm a smart guy, let's go talk to the movers and shakers and see if we can shake anything loose. I start with the state Democratic party, as I am currently partial to the Democrats. I find a list of candidates (over 100) for upcoming November elections. Just to be fair, I decide to take a look at the state Repulican party's website, and oh s***, look at this, they've invited the wicked witch of the East, the famous inflamatory Diva of Divisiveness, Ann Coulter. She's on my Blacklist. She and other so called "conservative" talk show hosts are one of the big reasons the Republican party has no credibitlity with me. You've heard that old Chinese curse: "may you live in interesting times"? Well, I think somebody has cursed us because times sure are interesting. I don't know which way things are going to go, except that I expect them to get worse, possibly much worse, before they get better. I don't expect any substantive change because the way things are now too many people are making to much money from illegal drugs. It is horrible to think of the thousands of people who have died in Mexico in the drug war in Mexico. However, I did hear one estimate that 90% of those killed were drug traffickers. These people presumably knew the risks they were taking by engaging in an illegal activity. Their luck ran out. Unfortunate, but they were combatants in this war. It's not like they were inoccent bystanders. Some of those engaged in the drug business may have been forced into it by economic circumstances. Perhaps they were unable to find any kind of job, or perhaps they were lured by the prospect of easy money. Hard to tell. The US went through a similar situation during prohibition when we tried to make alcohol illegal. I don't know if the number of people killed ever got into the thousands, but gang wars were common. The Mexican government may get an upper hand in this drug war at some point, but it will not last. The war will continue as long the US continues it's idiotic drug prohibition policy. Somebody leaned on the towel ring and loosened it's hold on the wall, so I set about fixing it. It's just screwed to the drywall, so it's not the most secure mounting in the first place, but this seems to be the standard for towel racks in modern America. As long as you don't hang on it, it's fine. If you have small kids, well forget it, you're gonna have holes in your walls. Seems this is the second time it's been repaired as there are four screw anchors in the wall here, so the whole area has disintegrated. The first thing I need is some kind of backstop behind the hole to support my patch. The hole is small and I really don't want to make it any bigger, so I come up with a tedious solution. I take a bit of wood about six inches long, drill four holes in it about an inch apart and then thread screws into the holes and then pull them back out so I can put the screws in by hand. Now I put a long screw in the first hole near the end, then using the screw as a handle slide the stick into the hole and then pull it up flat against the back side of the drywall. Now comes the tricky bit. Hold onto the handle screw (if you lose your grip, you will lose the stick to the wall monster) and slide it all the way to one side so the second hole is visible. Put a second screw in that hole and pull the first screw out. Repeat until the handle screw is in the last hole (which should be in the center of the board), and put two screws through the drywall into the stick, one on each end. Voila! Le steek du backup, she ees in place! Now we can carry on with our usual patch and paint procedures. The wood putty was not very stiff and wanted to flow out of the hole, so I made a dam out of scotch tape. That worked okay for the front, but evidently some ran out of the back because the top of the putty sagged inward. I used the putty instead of the spackle, because the spackle I've got (Fast & Final) is like made of fluff. It has no mass, and I suspect it has no strength. It was also old and dry and crumbly, so I took some of the crumbs and put them in a bowl with a few drops of water and mixed it up, using my fingers as a pestle. Seemed to work okay. The stuff is like concrete, a little water goes a long way. I put a teaspoon of water in the first batch and it turned to slush and I had to throw it out. A note about wood putty: A couple of years ago I repaired the door latch on Ross's apartment in Eugene with wood putty. We stopped by recently and I checked out this repair. It was still holding and it was still solid. Neither the screws or the latch plate had worked loose. I am amazed.